Hello Katie Girl: Ring Me on the Telephone! Ring Me on the Telephone! I love bold black and white graphic skirts because they always look so chic and they go with just about everything! In fact, I have quite a few of these skirts already but I still couldn't resist adding one more to my collection! The newest addition to my black and white graphic skirt collection is this button-down striped "birdcage" skirt from Target, although I really have no idea why they call this skirt a "birdcage" skirt. At first I thought this was because the stripes give it a cage effect but then I realized that the skirt comes in several other colors and patterns and those are also referred to as "birdcage" skirts, so go figure! This time around, I'm pairing this skirt with my Anthropologie "coloquial" telephone blouse because it had just the right "ring" to it! 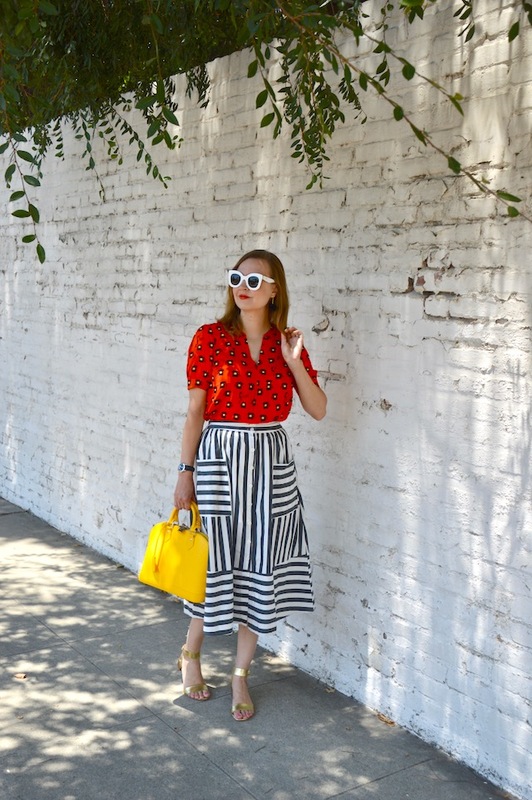 This is the blouse that I keep blogging about because I bought it in three different prints! At the time, that seemed excessive but I'm glad that I splurged because it sold out fast! The print is from a new line Anthropologie is doing called 52 Conversations in which they bring back old, classic prints, such as this telephone one, and issue them on new styles. If you check eBay, you can also find the original version of this blouse, which differs in that it is sleeveless. Now and again, the shirt does pop back on the Anthropologie website, so if you love the print you might be able to still snag it! Very nice print mix in this outfit! I always love your pattern mixing! What a fun shirt. Oh my goodness, I absolutely love everything about this outfit, EVERYTHING! Pinning it for inspiration. 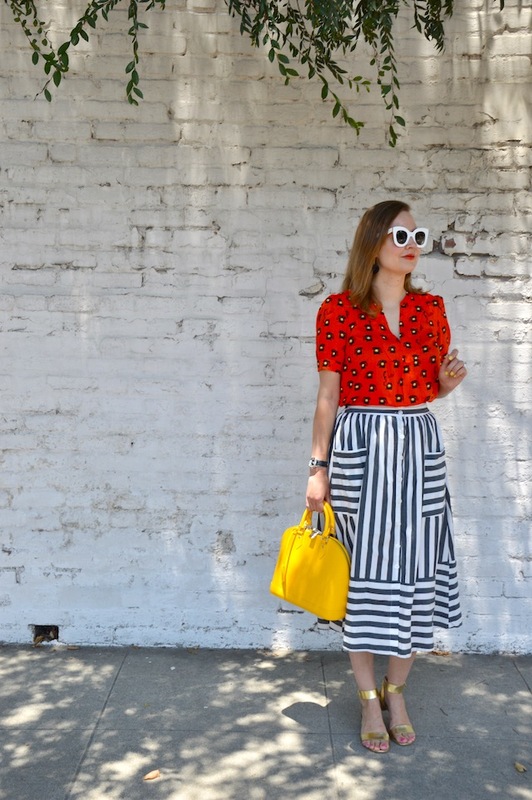 You are amazing at mixing prints and colors. You look fabulous! Thanks for joining my weekly linkup. You get the cutest tops at Anthro! I shop at Anthro through Poshmark and love their unique style. 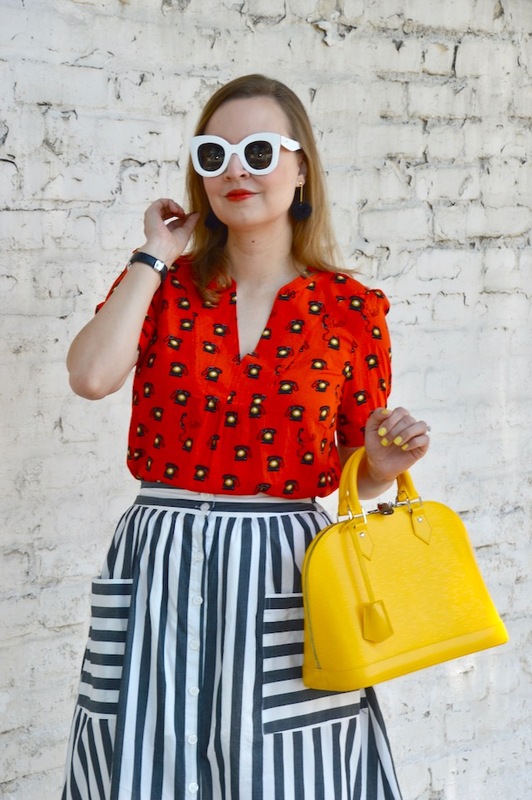 The skirt is lovely too and love the yellow bag with the red top.